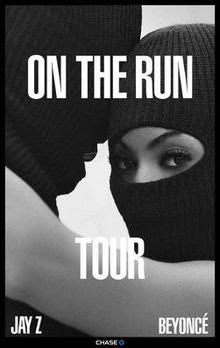 Poster from Jay-Z and Beyonce's previous tour. Superstars Beyonce and JAY-Z are heading out on a new joint tour this summer, according to a leaked concert listing posted online. Fans were sent into a frenzy on Monday (March 5) after a July 30 gig at Lincoln Financial Field in Philadelphia, Pennsylvania was uploaded to Beyonce's official Facebook page and ticket purchasing website Ticketmaster. The event was named as part of the On the Run 2 Tour, the follow up to the hip-hop supercouple's last joint trek in 2014. The Ticketmaster pre-sale had been scheduled to begin on Tuesday (March 6), but shortly after the news gained traction online, both listings were mysteriously taken down. Rumors of another joint tour have been circulating for months, and in November, rap mogul JAY-Z revealed they had actually been working on a full-length collaborative project before choosing to first put out their deeply-personal solo albums, which both addressed their marital issues. Beyonce's Lemonade release hit retailers in 2016, just over a year before the Empire State of Mind icon shared his latest material, 4:44. "We were using our art almost like a therapy session," he told the New York Times Style magazine, "and we started making music together. And then the music she was making at that time was further along. So her album came out, as opposed to the joint album that we were working on." However, the artists, who are now parents of three, haven't ruled out revisiting the joint project in the future: "We still have a lot of that music," the rapper explained. Meanwhile, Beyonce is busy preparing for her live comeback at California's Coachella music and arts festival in April, her first performances since giving birth to twins last summer. On Friday (March 2), the singer revealed she has gone vegan again to help her prepare for her stage return. "44 days until Coachella!! Vegan Time! !," she wrote on Instagram, alongside a photo of an avocado dish as she encouraged followers to check out her 22 Days Nutrition meal delivery plan, adding, "join me". She also posted two snaps from what appeared to be her concert rehearsals. Beyonce had initially been booked as a headliner for the 2017 Coachella line-up, but was replaced by Lady Gaga after pulling out due to her pregnancy.